Dorothy Brooks, fifth from left, of child life services at LLU Children’s Hospital, accepted handmade blankets from LLU School of Pharmacy students on Wednesday, March 14. 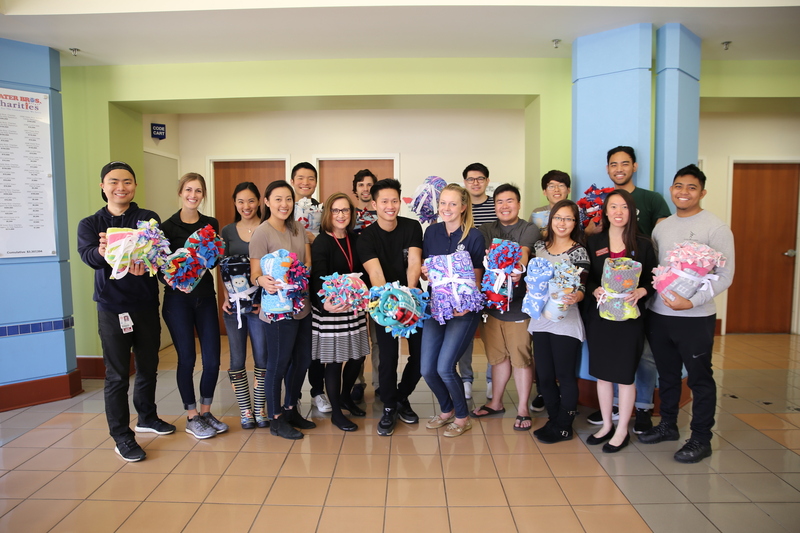 LOMA LINDA, CA — March 23, 2018 — Patients at Loma Linda University Children’s Hospital (LLUCH) are a little warmer now thanks to a group of students from LLU School of Pharmacy. Members from the student organization California Society of Health System Pharmacists (CSHP) delivered over 20 blankets to the hospital as part of their winter service project on Wednesday, March 14. Carina Deck, a third-year pharmacy student, said the group raised money over a two-week period earlier this year and purchased kits to make the blankets. They made the more than 20 blankets over a couple hours one day. Deck and 14 other students form CSHP delivered the blankets to child life services at the hospital. “We all want to be hospital pharmacists, so it was befitting that we dedicate our service project to a children’s hospital,” Deck said. Dorothy Brooks from child life services accepted the blankets, assuring the students they would all be given to patients that day. Unfortunately, because of flu restrictions, the students were not able to deliver the blankets directly to the patients. Brooks confirmed that most of the blankets went to the acute care adolescent unit that same day.